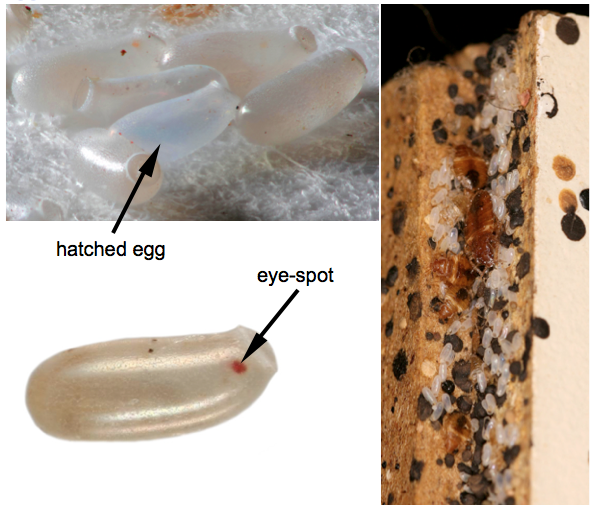 As bedbugs do not have a larval stage, these features are visible at all stages of the lifecycle (except the egg). The eggs of bedbugs are small (ca. 1.2 mm long), but easily distinguishable (with experience) from those of other household insects. Under magnification hatched and viable eggs can easily be distinguished. Viable eggs are pearl coloured and, during the later stages of development, the eye-spot of the developing embryo is visible through the shell of the egg. Hatched eggs are recognisable by the absence of an end-cap and their translucent appearance. With experience the cast skins of bedbugs are easily distinguishable from those of other insects. However, they can last for a long time and cannot therefore be used to distinguish active and past infestations. Bedbugs start producing dark, aqueous faecal material as soon as they have fed. These faecal spots are often one of the first indicators of an infestation. Black, ink-like spots on the sheets, mattress or bed frame are one of the most recognisable tell-tale signs of bedbugs. However, very similar spots can be produced by spiders, flies and German cockroaches, so location can be an important factor in distinguishing the two. Spots found high on the walls, on the ceiling, or on light fittings are much more likely to be produced by flies. 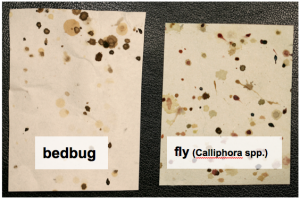 Blood identification kits have shown promise at being able to distinguish the faecal material of blood-feeding insects, such as bedbugs, from that of other household invertebrates the products section. Faecal spots can vary in colour from black through to tan depending upon the relative proportions of digested blood and uric acid. The appearance of the faecal spots is also influenced by the absorbency of the substrate they are deposited on. 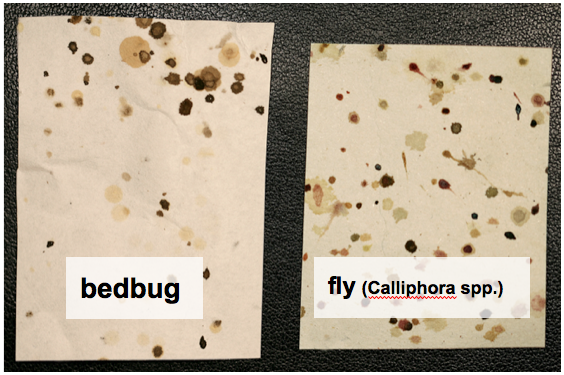 Faecal spots deposited on absorbent surfaces such as bed sheets are wicked into the fibres, resembling ink from a fountain pen. Faecal spots deposited on non-absorbent surfaces such as varnished wood, often dry as a dark, raised lump. Bedbugs feed on exposed skin and often prefer not to climb onto the host as they feed. This can cause bites to occur in rows as they move along the edge of the exposed skin searching for a suitable feeding site. 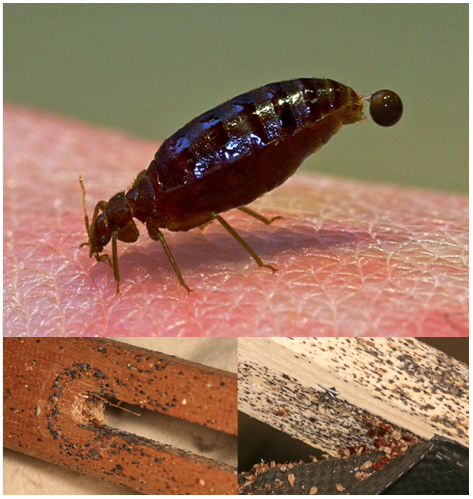 Bites should never be considered a conclusive sign of a bedbug infestation, as they can be caused by a range of other insects including midges, mosquitoes, fleas and lice. Similar reactions can also be caused by scabies mites and a wide variety of allergens. Reactions to bedbug bites are highly variable between people. Some have no reaction at all, while others have strong, blistering reactions. More serious (anaphylactic-like) systemic reactions are rare but have been reported. The skin reaction to a bedbug bite may be delayed for up to two weeks, particularly if it is the first time that the sufferer has been bitten. Consequently, if the person has recently been traveling, it can be difficult to establish exactly where and when the bites occurred. This can lead to the false belief that they have brought bedbugs home with them or alternatively lead to delays in the detection of an infestation. Bedbugs usually feed at night, however, they are highly adaptable and will adjust their feeding cycle depending on the daily movements of the host. Chairs and sofas often become infested in situations where the occupant spends the majority of the day sitting in one place. In such situations bedbugs will be forced to feed during the day, while the host is present.